Mr. McCain’s flag-draped coffin was escorted out of the cathedral by 15 honorary pallbearers representing a who’s who of the senator’s friends and colleagues from both sides of the aisle, including former Vice President Joseph R. Biden Jr., former Mayor Michael R. Bloomberg of New York, the actor Warren Beatty and a plethora of current and former senators and cabinet secretaries from both parties. Also among the pallbearers was Vladimir Kara-Murza, a prominent Russian dissident, a choice meant to symbolize Mr. McCain’s unflinching opposition to the authoritarian government of President Vladimir V. Putin. Among the invited guests elsewhere in the cathedral was Bill Browder, the investor who championed legislation that Mr. McCain helped sponsor to punish Russia for human rights abuses. Obama’s implicit censure of Trump. Echoing the words of his predecessor, former President Barack Obama recalled Mr. McCain’s mischievous streak, his passion and his frequent sparring with people he disagreed with. “What better way to get a last laugh than make George and I say nice things about him to a national audience?” Mr. Obama said as Mr. Bush laughed along with the rest of the audience. Mr. McCain’s critiques, he said, made both men better presidents. And like Mr. Bush, Mr. Obama did not mention the absent president by name, but delivered an implicit censure of Mr. Trump’s immigration policies and attacks on the press. “He understood that if we get in the habit of bending the truth to suit political expediency or party orthodoxy, our democracy will not work,” Mr. Obama said. 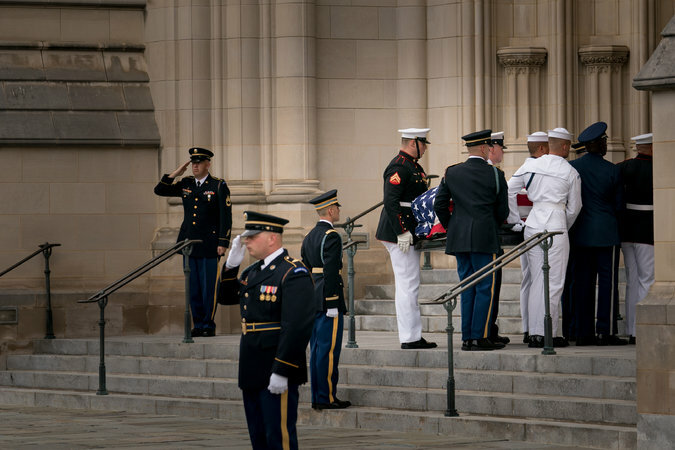 Pallbearers carried Mr. McCain’s coffin into Washington National Cathedral. George W. Bush recalls a friendship. Former President George W. Bush reflected on a political rivalry with Mr. McCain during the campaign for the 2000 Republican presidential nomination, a rivalry that later became camaraderie. Mr. Bush did not mention the current president, but his tribute carried an undeniable contrast with the current administration’s policies. Meghan McCain: A tribute to her father, a rebuke to Trump. The service began with Meghan McCain delivering an emotional tribute to her father through tears, one that included a steely rebuke to her father’s most prominent critic — President Trump, who had spent the morning talking about himself and his administration on Twitter. “We gather to mourn the passing of American greatness, the real thing, not cheap rhetoric from men who will never come near the sacrifice he gave so willingly,” she said. Senator John McCain’s daughter Meghan McCain delivered an emotional tribute to her father that included a steely rebuke to President Trump. Photo by Tom Brenner for The New York Times. As Kissinger eulogizes, Trump tweets. As Henry A. Kissinger, the former secretary of state and national security adviser, began recalling Mr. McCain’s years as a prisoner of war in Vietnam, Mr. Trump continued to post on Twitter, switching his focus to Canada and the North American Free Trade Agreement. He said there was “no political necessity” to keep Canada in a newly negotiated deal with Mexico. A crowd waits for Cindy McCain, Senator John McCain’s wife, to lay a wreath at the Vietnam Veterans Memorial in Washington on Saturday. Mr. Trump was en route to his golf course in Virginia. Ivanka Trump, his eldest daughter and senior adviser, was in attendance at Mr. McMcCain’s funeral, along with other senior members of his administration. Trump leaves the White House. In the final moments of Meghan McCain’s eulogy, Mr. Trump took off in a motorcade from the White House, destination unknown but presumably his golf course in Virginia. According to reporters traveling with Mr. Trump, “the president is wearing a white shirt-sleeved shirt and white MAGA hat” — the very slogan that Meghan McCain took aim at in her eulogy. In the week since Mr. McCain’s death, his closest friends have been recalling their favorite, private moments with him. For John Lehman, the former Navy secretary, one of them came shortly before Mr. McCain received the diagnosis of brain cancer that would eventually take his life. On the weekend of June 14, 2017, Mr. McCain, Mr. Lehman and three other friends secretly escaped Washington for a three-day dining and gambling trip to Monaco, the place where Mr. McCain had first learned to play craps while on shore leave from the Intrepid in 1961. Mr. Lehman recalled how the small group was greeted by Prince Albert and Princess Caroline — the leaders of the tiny principality and longtime friends of the senator. Past midnight, after a long meal at the palace, with a lot of wine and a leisurely tour, Mr. Lehman said the group — which included Rick Davis, a former campaign chairman; Steve Duprey, a New Hampshire businessman; and Steve Wynn, a Las Vegas casino magnate — prepared to head to their hotel. For more than four hours, Mr. McCain stood at a craps table, merrily placing bets and rolling the dice as he occasionally paused to take a selfie with admirers. In the end, they finally pulled him away from the table after 4 a.m., having won €900. “He was really happy,” Mr. Lehman recalled fondly. As the McCain family, led by Ms. McCain, filed out of the motorcade and walked in front of the cathedral, the dull hum of noise at the scene went silent. The family watched pallbearers carry the flag-draped coffin up the steps and into the cathedral and quietly followed, heads bowed. A split-screen moment in time. The proceedings played out against gray skies and were punctuated by the angry tweets of a president who had not been invited. Back at the White House, Mr. Trump refrained through midmorning from leaving for his usual trip to his golf club, and instead tweeted about the Steele dossier, President Barack Obama and Hillary Clinton. He also shared a favorable review of his administration just as the hearse carrying Mr. McCain arrived. 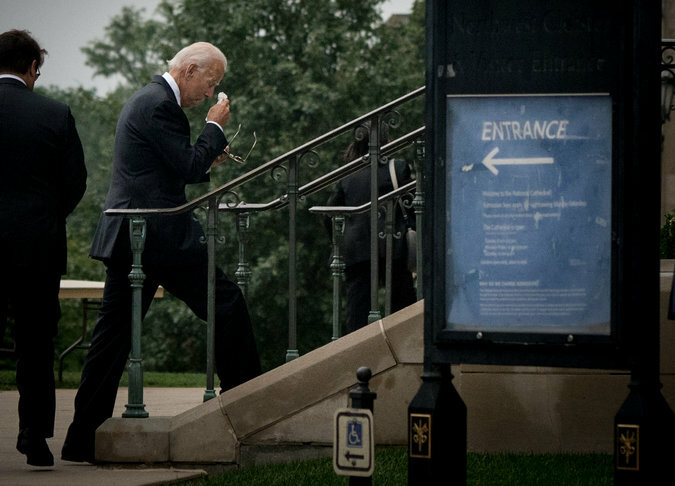 Former Vice President Joseph R. Biden Jr. wiped away tears as he entered Mr. McCain’s memorial service. The president was not alone in his desire to publicly squabble over partisan politics as the McCain family followed their patriarch into the cathedral. A tweet sent by Senator Chuck Schumer, the New York Democrat, angrily accused Republicans of colluding to keep documents related to Judge Brett M. Kavanaugh, the Supreme Court nominee, private. Minutes later, Mr. Schumer quietly took his seat near Senator Mitch McConnell, the majority leader. While the rest of Washington was honoring Mr. McCain, President Trump spent the early hours of the day tweeting his anger about the investigation into his campaign’s ties with Russia during the 2016 election and sending out quotes from a mutual critic of the F.B.I. and Justice Department. Ivanka Trump and Jared Kushner arrive. While President Trump was not invited to the service, his daughter, Ivanka Trump, and son-in-law, Jared Kushner, arrived, the most prominent figures from the current administration to attend. John Bolton, the president’s national security adviser, also made his way in. Most of the rest of the crowd filling the Washington National Cathedral were committed opponents of the current president, not just Democrats. Former President Bill Clinton and former Secretary of State Hillary Rodham Clinton were expected to attend. Former Secretary of State John Kerry, Senator Elizabeth Warren of Massachusetts and Gov. John Kasich of Ohio mingled among the dignitaries. Cindy McCain stops at the wall to pay her respects. On her way to Senator John McCain’s memorial service, Ms. McCain stopped at the wall to pay her respects, flanked by John F. Kelly, the White House chief of staff, and Jim Mattis, the secretary of defense. Photo by Ray Whitehouse for The New York Times. Two minutes before 9 a.m., Ms. McCain began walking down the path to the Vietnam Veterans Memorial, flanked by John F. Kelly, the White House chief of staff, and Jim Mattis, the secretary of defense. As she slowly walked, the crowd of onlookers held American flags and cellphones aloft, watching the procession of the McCain children following her. In front of the memorial, Ms. McCain paused and stood by a patriotic wreath that was moved toward her. A minute later, she turned to make her way back to the funeral procession, striding past unfurled American flags and veterans wiping away tears. As she and her children returned to the black cars waiting to head to the Washington National Cathedral, the crowd broke into a minute of applause: a steady stream of clapping that broke the morning silence. In Ms. McCain’s presence, several onlookers saw recognition of more than just Mr. McCain’s legacy, but of their own: the high school classmates they mourned from a despised war, the family members currently in service and veterans they have loved and lost. “He embodied what all these men fought for,” said Cyndy Hollender-Stancliff, a volunteer at the Vietnam Veterans Memorial. After Ms. McCain left, the crowd made its own procession: walking the length of the memorial to stop in front of the wreath of red, white and blue flowers with a Navy ribbon that read “In Honor of All Who Served” in gold curlicue font. They left their own tokens — American flags in the stone, posters — before quietly leaving, their fingers brushing against the names of others who served. One woman, standing off to the side with a small American flag, smiled slightly when asked why she came to the memorial. “Just a good man,” she said, wiping away a tear. Senator John McCain was brought to the Rotunda to lie in state. Leaders from both parties paid tribute to the celebrated lawmaker. By NEETI UPADHYE on Publish Date August 31, 2018. Dignitaries make their way to the cathedral. Joseph R. Biden Jr., Mitt Romney, Madeleine Albright, David Petraeus and Jay Leno were among the guests trickling into the Washington National Cathedral as the church bells chimed. Lines of naval officers in their crisp dress whites walked to and from the cathedral, all in front of a sprawling media encampment preparing for the day’s events. Mr. Biden, who delivered an emotional eulogy at Mr. McCain’s funeral service in Arizona, pulled out a handkerchief and dabbed his eyes as he entered the cathedral. Among the uninvited: members of the Westboro Baptist Church, who gathered a few blocks away from the cathedral. “MOST PEOPLE GO TO HELL” was among the few printable signs. Gathering outside the Vietnam Veterans Memorial. 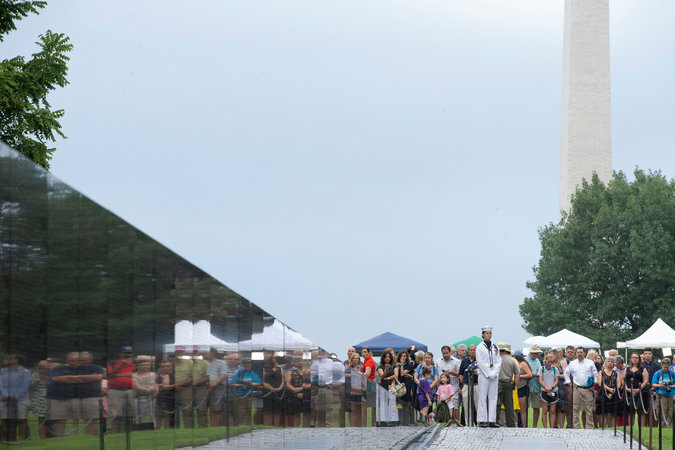 Dozens of people gathered around the Vietnam Veterans Memorial, forming a quiet ring on the outskirts of the wall before Ms. McCain arrived to honor her husband and other veterans of the Vietnam War. It was almost silent, except for the clipping of Park Police horse hooves on gravel, the rustling of the leaves and the faint strains of the national anthem played in the distance. The people who gathered — veterans, parents in uniform with their children, runners who paused midstride — were there not just to pay respects to Mr. McCain. They were there for Ms. McCain and their own loved ones who had served. Mr. Whiteaker made the 10-hour drive from Knoxville, Tenn., with his wife, Shirley, who also served in the Air Force. They brought handmade signs, decorated with American flag stickers, and condolences for the McCain family. A stubborn grayness rested over Washington, the vast sheet of dark clouds threatening rain as clusters of mourners walked into the cathedral, dressed in black. An American flag hung at half-staff on the front lawn. Police cars and television vans lined the block, the hum of a dozen running engines clashing with the cathedral’s bells. People began lining the streets around the cathedral long before Mr. McCain arrived, pushing baby strollers and holding cups of coffee. Two blocks away, a family stood in their driveway, packing up their car for a camping trip. “On Saturday mornings, we usually go get doughnuts,” said Louie Renjel, 9, who stood with his father, Louis, at the base of the cathedral’s driveway in a T-shirt and flip-flops, waiting to see Mr. McCain’s coffin arrive. Louie detailed the data points he had learned from his father, a former Senate staff member, about Mr. McCain’s five and a half years as a prisoner of war. Mr. Renjel in recent days found himself watching Mr. McCain’s concession speech for the 2008 presidential election on YouTube.